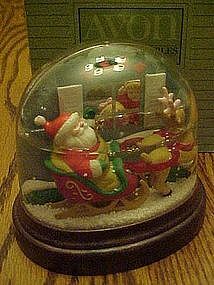 Collectible snow globe from Avon 1988. The globe lights up, a switch is on the bottomand it uses 2 AA batteries. Measures 4 1/2" tall. Original styro packing and box. It looks like some of the water may have evaporated, maybe they didn't fill them up(?? ).Santa Claus in his sheigh and reindeer on one side (outside of house). Turn it around and it has two Children peeping through the window in their pjs by the tree ( When turned on light shines from inside out through the window. (inside the house). Has always been in the box stored.